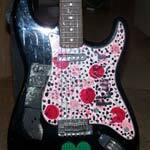 it came shipped to me in Kurt's Daphne Blue Fender Mustang guitar case. from the auction description: "Pat played this guitar at most every show during Nirvana's 1993-1994 In Utero tour of North America and Europe. Around midway through the tour, Pat modified the look of this instrument, affectionately named 'Flopsy', using several different colors of nail polish and covering it with polka dots and smiley faces. This Mexican made Strat was sent to Pat by Fender early on during the U.S. tour. It has not been played since Nirvana's final European dates in 1994 and still has the strings and strap from its last performance."